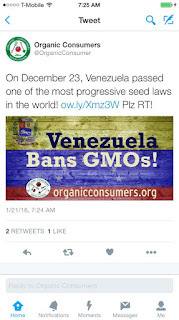 This is a guest post by a fellow #moms4gmos, Dr Alison Bernstein, aka Mommy PhD. You can follow her on twitter (@mommyphd2) or on Facebook. An old article from Nathanael Johnson on Grist, What I learned from six months of GMO research: None of it matters, from January 2014 showed up in my feed on various social media platforms recently. 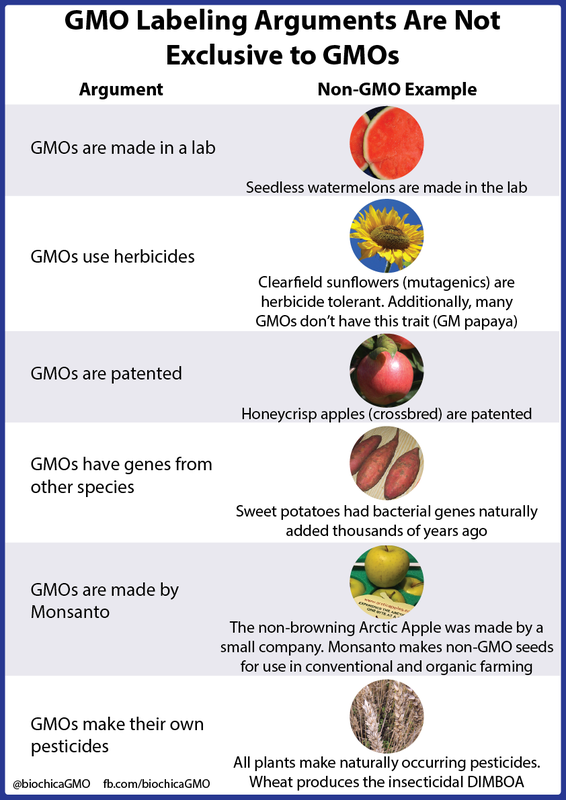 You may wonder: if none of it matters, why are we still talking about GMOs two years later? To many people, it may not be immediately obvious why this conversation about GMOs is important. Genetic engineering is an important tool for tackling problems of food security around the world. In the original article, Nathanael wrote that stakes are low in the GMO conversation. I’ll admit, the implications do seem more remote and less severe than they do for, say, the issue of childhood vaccinations. This is especially true for those of us living in the US and other countries where food is abundant and our choices are varied. However, to say the stakes are unimportant seems naive about the realities of food production, particularly in the developing world. Here are a couple of examples of real world problems for which genetic engineering is an important tool to use to solve these problems. Opposition to GMOs has delayed the testing and use of Golden Rice (rice fortified with beta-carotene, the precursor of Vitamin A) in populations where children are literally going blind and dying from Vitamin A deficiency. According to the World Health Organization, Vitamin A deficiency is the leading cause of preventable blindness in children. Each year, between a quarter and a half a million Vitamin A-deficient children become blind and, of those, half die within 12 months of going blind. This is most common in Southeast Asia, where rice is a staple of the diet.Rice is low in the dietary precursor of Vitamin A, beta-carotene. Golden Rice produces higher levels of beta-carotene that could provide a significant proportion of the daily required amount of vitamin A. However, anti-GMO opposition has prevented testing and development of this product that could have a dramatic effect on the lives of children in Southeast Asia. Is Golden Rice the only option to provide Vitamin A supplementation? Of course not. Is Golden Rice a very good way to provide Vitamin A supplementation? Probably (we need to study that, but anti-GMO opposition has prevented even studying it). Biofortification is important in crops in other areas of the developing world, where people have little variety in their diets and would greatly benefit from additional nutrients. It seems tragic to disregard a tool that has already been developed while children continue to suffer because some people are afraid of or don’t understand the technology. Citrus greening (Huanglongbing) is a disease that kills citrus trees. This is devastating for citrus growers in California, Florida, and other citrus-producing states. In Florida alone, according to a 2012 study from the University of Florida’s Institute of Food and Agriculture Sciences, citrus greening cost Florida $3.63 billion in lost revenues and 6,611 jobs in the first 5 years since citrus greening was detected in Florida. There are non-genetic engineering strategies out there, but there are significant issues in the implementation of those strategies. Despite success with other disease resistant crops (e.g. ringspot-resistant papayas, which saved the Hawaiian papaya industry), researchers and farmers have been unable to move forward with genetically engineered orange trees because of anti-GMO sentiment. In the developing world, disease resistance is especially critical where diseases threaten staple crops that make up a huge proportion of local diets. As with Vitamin A deficiency, genetic engineering is not the only answer. However, it is a powerful tool that can be used in combination with other tools to address these really serious problems. Ruling out this technology based on fear and misinformation is hurting citrus growers and the economy. These are just two examples of issues where the stakes are high. While genetic engineering is not the only strategy available to address these problems, other strategies are failing, or not working fast enough. Disregarding an entire set of tools based on fear and ignorance restricts our ability to find solutions to real problems. Using all the tools available to us seems to be the best way to approach these problems. Many people think “pro-GMO” means pro-everything that biotechnology ever produces. This is not the case, in my experience. 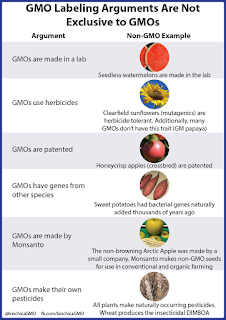 “Pro-GMO” is a misnomer in the sense that people who are “pro-GMO” do not typically lump all genetically engineered products together and accept them blindly just because they are genetically engineered. In fact, one of the main reasons for opposition to mandatory labeling is that the proposed labels group all genetically engineered crops together with no regard to what the product is. This makes a GMO label meaningless. Instead, those who are “pro-GMO” push for the consideration of each product on its own merits, because the method of breeding tells us nothing about the finished product. “Pro-GMO” is also somewhat meaningless, because “GMO” itself, as used in the public discourse, is a meaningless term. Genetic engineering is a breeding method, a very precise breeding method. It refers to a specific a set of techniques used to produce a plant with some desired trait. Nearly all the plants (and animals for that matter) that we eat today have been genetically altered by humans through mutagenesis, crossbreeding and artificial selection. The “natural” or wild counterparts of these foods would be unrecognizable to us. To call only food produced by transgenesis “GMOs”, while ignoring all the others makes no sense. If genetically modified organism means “any organism that has been modified due to human intervention”, then nearly all of our food is a GMO. The method by which that modification occurs is irrelevant. Lumping everything made by transgenesis together creates an arbitrary category that tells us nothing about the end product. The type of breeding used to create a plant tells us nothing about the properties of that plant. An apple is an apple no matter how it was created. Most people who are “pro-GMO” recognize that not every genetically engineered crop developed will be useful or a good option for every problem. I have never seen someone who is “pro-GMO” say that genetic engineering is the one and only answer to all of the world’s agricultural and food problems. Genetic engineering is just one piece in a larger toolkit for farmers and scientists to address issues of correcting vitamin deficiencies, reducing pesticide use, increasing the sustainability of agriculture, and saving important crops from disease. However, genetic engineering is a powerful technique and to disregard it entirely because a segment of the population doesn’t understand it is shortsighted. 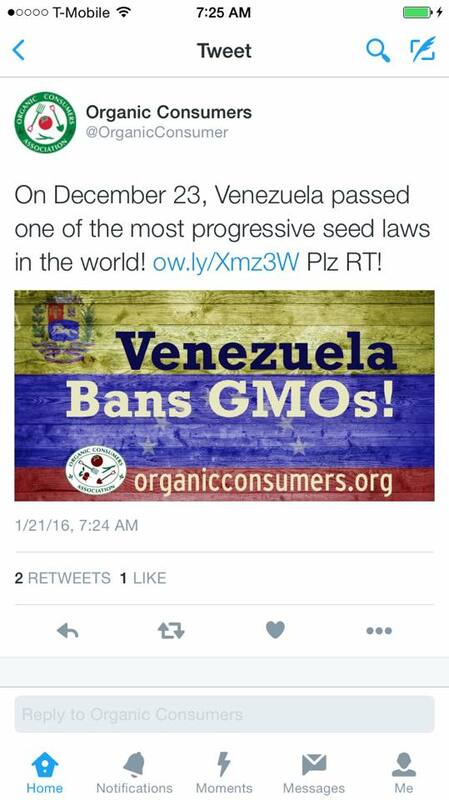 Pro-GMO is really pro-science and pro-evidence-based policy. To me, the real issue in the GMO conversation is a much broader concern, not exclusive to GMOs or even agriculture. The real issues are not allowing fear and scientific illiteracy to drive policy and promoting evidence-based policies. The GMO conversation is not occurring in isolation. It is part of a larger conversation about science- and evidence-based policy. 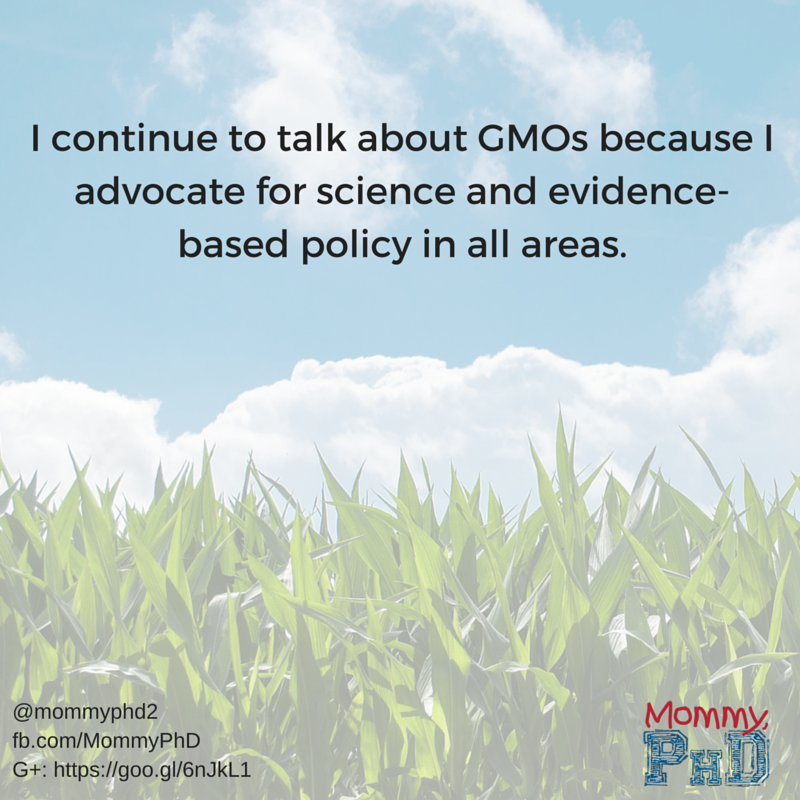 Those of us who are adamant about GMOs are so because we are advocating for science- and evidence-based decision making in multiple domains. The future of GMOs in agriculture just happens to be a domain that is a matter of considerable public concern at the moment. We continue to talk about GMOs because to not advocate for evidence-based policies is to allow an environment to persist where it’s acceptable for creationism to be taught in science classes despite overwhelming scientific consensus on evolution; for politicians to do nothing to combat global warming despite overwhelming scientific consensus on global warming; for parents to choose not to vaccinate their children, contributing to outbreaks of preventable diseases, despite overwhelming scientific consensus on the safety and efficacy of vaccines; and for quacks to take advantage of desperate people by selling fake cures and false hope for cancer, autism and other real and fabricated diseases. 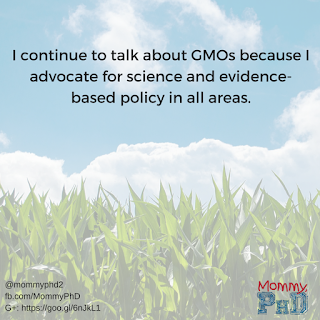 We advocate for science and evidence-based policy about GMOs because we advocate for this in all areas. Note: This post was originally published in the Sound of Science Blog in October 2015.